Gordon Banks's most famous save from Pele in the 1970 World Cup. He said: "If I can make a save like the one against Pele... I will be able to battle through this health problem." 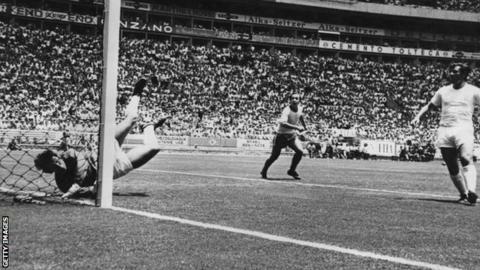 England's 1966 World Cup-winning goalkeeper Gordon Banks has revealed he is being treated for kidney cancer for a second time. The former Leicester and Stoke player made what is regarded as the greatest save in the history of football for England against Pele's Brazil in the 1970 World Cup. Banks lost one kidney to cancer 10 years ago and his latest diagnosis came after a holiday last year. He said that his sporting achievements, including winning 73 international caps, gave him the "confidence" to "battle through this health problem." Born in Sheffield, Banks was named Fifa goalkeeper of the year six times during his career, which was cut short when he lost his right eye in a car crash after training in 1972. In May, Stoke unveiled a bronze sculpture of club president Banks outside the Britannia Stadium. He was also granted the freedom of the city.